“Not for your trailer, but there is a sink outside the (non-functioning) bathroom you can get drinking water from. Or, you can get water here at the Visitor Center, or use the flush toilets here.” (The VC is about 1/2 mile from the campground). Perhaps, this was not the best start. We were lucky to get setup before the wind started to knock us around. It was only 4pm or so – way too early to pack it in and hunker down for the evening. So, John decided to hike back to the Visitor Center to check out the exhibits and the movie (nearly all Visitor Centers have movies of their park, which we love). My job was to take Jezzy for her pre-dinner poop stroll. 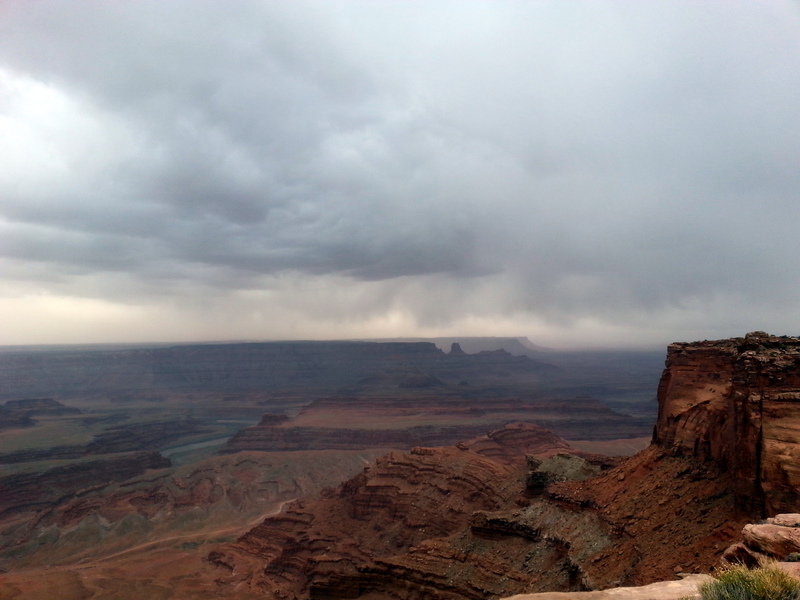 Heading out to Dead Horse Point seemed like a good choice, since it was only 1.5 miles each way. Jezzy doesn’t like wind. When it’s windy, she thinks it may lead to thunder, and she HATES thunder (see posts on Thundershirt). But, she needs to learn that she doesn’t get to make ALL the decisions in our household. So, off we go on a trail, which heads out on the east rim of the Canyon, about 2000 feet above the Colorado River. Every now and then we get pelted by a blast of rain. Dark clouds are rolling in, and the wind is definitely picking up. Jezzy’s not happy. I’m less than joyous myself, but we’re on a mission. 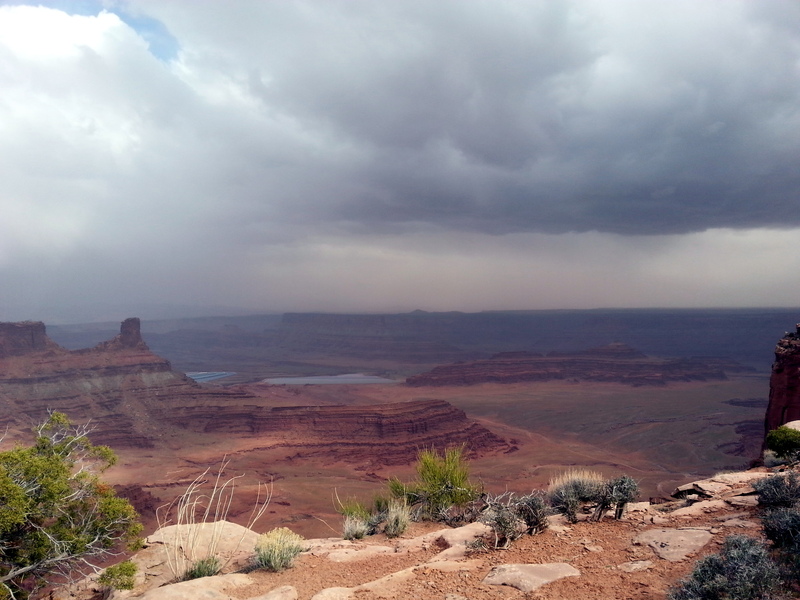 After a mile or so, we are headed to a narrow point on the Canyon rim, where we’re about to head out onto a thin strip of land known as Dead Horse Point. Legend has it that cowboys would round up wild mustangs and corral them at this point, about 30 yards wide. Fencing off the open side with scrub and brush, they would choose the horses they wanted to keep, and leave the unwanted horses on the point, and they would die of thirst. Below, the Colorado River makes a 180 degree swing. It’s a spectacular viewpoint. However, as we neared the neck of the point, the wind gusts nearly knocked me off my feet! Jezzy was wild and frantic, trying to dodge behind me so that I could protect her. Me? I wanted to hide behind her! So, we retreated, without getting to see the famous bend. Safely home, we battened down and got biffed around by gusts of 55mph. It was wild. At one point, we headed out into the howling win to help out our tenting neighbor. His tent had become unmoored from three of its four stakes, and was flailing around wildly – we feared it would become totally unhitched, and fling itself over the canyon wall. He got it under control, but I’ll bet he’ll be sleeping with red dust in his sleeping bag for years. Finally, around 2am, things settled down. Quiet prevails again. In the calm of morning, we look with dismay at the interior of the Fireball. Every surface is covered with a fine red grit. Our soft slippers make scratchy noises on the floor, and our coffee cups sound like sandpaper on the tabletop. We got just enough rain to set the dust into a red cement on the windows. It’s awful enough that we just had to escape. 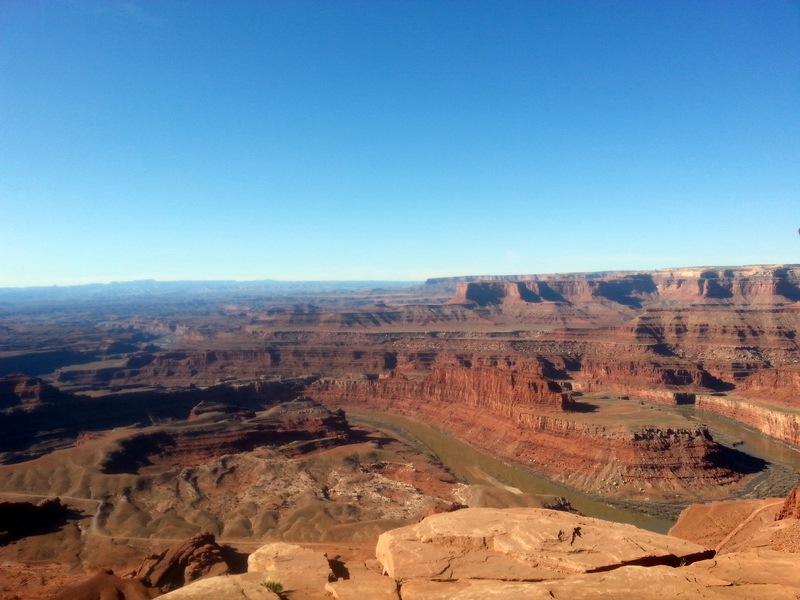 We headed out on the Trail again, and this time got to see the famous Dead Horse Point. It was worth the wait. We’ll get around to cleaning up some time later today. This entry was posted in camping, dogs, great outdoors, hiking, pets, retirement, RV life, simple camping, state parks, Thundershirt, Utah and tagged camping, dogs, hiking, retirement, road trip, RV life, simple camping, state parks, T@DA, Utah by Judy Crankshaw. Bookmark the permalink. Quit scaring my niecepup! It’s a little late to grow bravery for her. The list of things Jezzy fears gets longer everyday. On the other hand, she’s seen several jackrabbits, and seems to like them very much. I’m glad that every one is safe and sound! 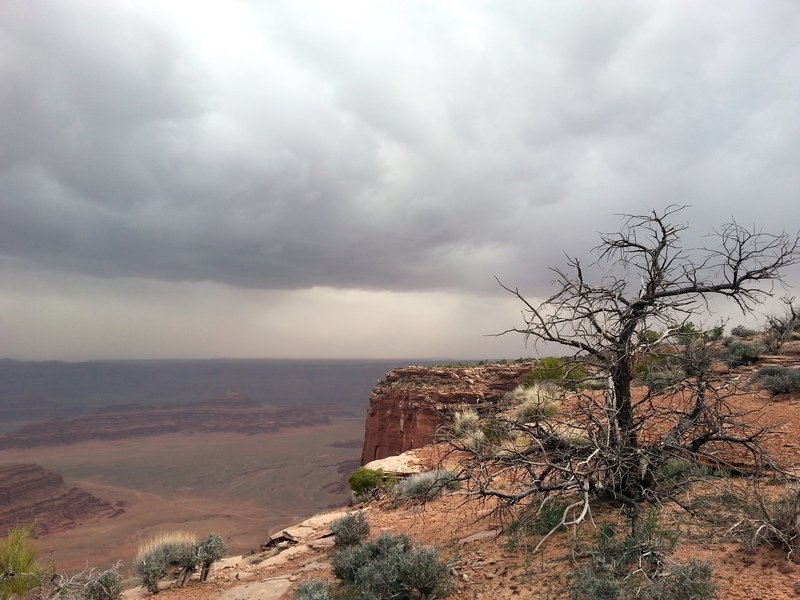 The scenery is spectacular, but I don’t think that I would walk the edge of a canyon in those winds, and I like wind. I wasn’t that close, believe me. More big winds today – bummer.